"My goal is to foster compelling reasons for providers to participate in changing health care programs. I continue to liaison with doctors to encourage and evoke a spirit of collaboration with stakeholders. As we lead to shape and align functional and operational components of this industry, excellent administrative policy and information technology teams will improve health delivery to the people that we serve." Dr. Mlawsky served as Medical Director at the EDS Medi-Cal fiscal intermediary account. For over a decade, Steve professionally consulted for EDS and DHS. The doctor has extensive clinical experience plus a health care management background. He oversaw the administration of cost-effective quality care delivery processes. He also advised executive operations, customer relations, engineering, and quality management staffs. Forecasting future trends, he discovered, identified and defined business requirements, posturing clients to accept change implementations and health industry innovations. Steve exercises project management, data mapping and process modeling skills. He leads clinical solution teams for Decision Support System offerings and is familiar with N.C.Q.A. - H.E.D.I.S. encounter data reporting and physician profiling elements. Dr. Mlawsky has been a faculty panelist at medical symposia, representing the States' health care presence to colleagues at national standards conferences and healthcare technology conventions. Activity involves participation with work groups dealing with Internet Authentication, Privacy, Confidentiality, Security, Coding Standards, Medical Errors and the H.I.P.A.A. standards. Dr. Mlawsky introduced Department of Health Services medical policy directors to web-enabled business tools. Steve also has chaired Think Tanks. The doctor's responsibilities have involved assessing organizational needs and priorities for medical information. He participates in system enhancement designs, identifying and qualifying healthcare opportunities, and brokering strategic alliances with entities for synergy. While providing direction for cost-savings ideas, the doctor gained acceptance for these innovative projects, concepts, and programs. Steve helps providers understand programs and helps them to resolve claims payment problems. The medical director influences and leverages data integration projects. He assesses national health care trends and their impact on medical care outcomes. Additionally, he coordinates provider services, measuring and interpreting data to recommend methods that can narrow the range of process variability. Identifying best-in-class, evidence-based clinical pathways, he teams with colleagues to benchmark and apply appropriate controls that improve health care access and quality for beneficiaries. Dr. Mlawsky is an experienced Primary Care and Emergency Room doctor with over twenty years of clinical practice during his medical career. A Fellow of the American Academy of Family Physicians, he has also been an active member of the California Medical Association and served on that organization's Health Reform Sub-Committee and their Council on Legislation. 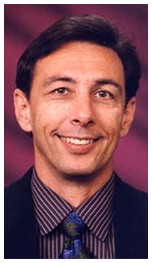 Steve is a boarded physician Diplomat, licensed in California and in Nevada. He has also acquired Certification from Carnegie-Mellon University, H. John Heinz III School of Public Policy and Management while pursuing their Masters of Medical Management degree program. Dr. Mlawsky was a member of the American College of Physician Executives. - EDS provides systems management and fiscal agent services for the California Department of Health Services. - Responsibilities: Medical Director for California's Department of Health Services Medicaid Fiscal Intermediary. - Emergency Room Facility serving Northern Nevada. N. California Medicare Carrier Jack Lewin, M.D. 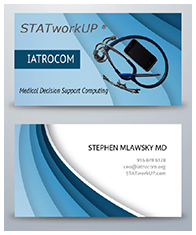 STATworkUP is NOT intended to treat, diagnose, cure, mitigate, or prevent disease or other conditions. Information that is contained in this app should NOT be substituted for the expert advice of licensed physicians or other qualified healthcare providers. The software's developers make no representation of warranty about the merchantability or fitness of this product for any purpose. Users assume all liability for utilizing its database. Should application result in any damages, operators agree to fully indemnify IatroCom, our enterprises and any other affiliates. "STATworkUP is NOT intended to supplant sound medical judgment." Copyright © 1985 - 2019 IatroCom. All Rights Reserved.